07.30.08 Maine Girls Champion Sorel Edes defeated Autumn Douthitt (1154) of Tennessee in round 3 of the Susan Polgar National Invitational to move up to an even score of 1.5/3.0. In round 4 she will play the black pieces on board 15 vs. Elizabeth Oliver (1322) of Nebraska. Round 3 gets started on boards 5 and 6. 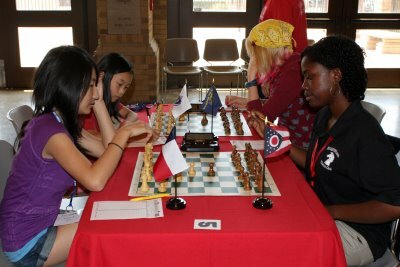 In the forground Brianna Conley (1573) of Ohio (right) considers her second move in a double king pawn opening vs. Sylvia Yang (1911) of Texas. On board 6 Taylor Bailey (1650) of Oregon (right) tries a different tack against Massachusetts Girls Champion Michelle Chen (1762) by essaying the Scandinavian Defence. Image courtesy susanpolgar.blogspot.com. Thanks Dan for posting. I am rooting for these young ladies, but win or lose they will all have a memorable experience. You certainly do a great service for the state of Maine.